GadgetMadness Did FSLogix Just Kill Legacy Profile Management for Server-Based Computing? Not long after their first funding round and winning Best of Citrix Synergy 2015, FSLogix has built a pretty amazing feature into their already very effective solution. In the past I wrote a few articles about some other features, such as Font Management and Java Version Management (see Managing Multiple Java Versions with FSLogix Apps for more info). When I saw that they released a beta of their new FSLogix Apps 2.0 with a feature called profile containers, I had to take a look, and asked Brad Rowland to hook me up with a trial. I was not disappointed. 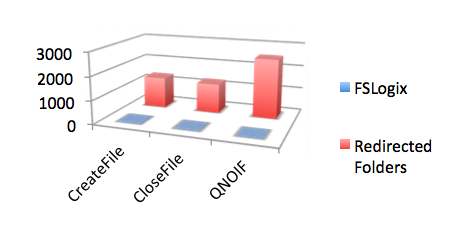 Take a look at this graphic that shows file reads overhead of FSLogix Apps 2.0 vs. other profile management solutions. Thanks to their new approach to the architecture, FSLogix is only reading a single file instead of the thousands or more that are usually read within every single profile. You can probably imagine just how much benefit this brings to the table. See the full article here GOODBYE legacy profile management. Profile management has never been the funnest part of IT. I remember my days with the headaches of roaming profiles and endless complaint calls to the help desk, “It’s so slow logging in to my desktop”. No matter what environment you were working in, whether it was folder redirection through group policy, Citrix UPM, Roaming Profiles or whatever the solution of the day, just the site of the documentation could make your head spin. No matter how good you are with profiles there are so many moving variables involved that problems tend to result in loss of data and recreating profiles, or super slow logins and sustained CPU spikes on your file servers. Seems like people have focused on trying to optimize a broken model. So going into the testing, I was expecting this to be complex and time consuming. I thought I would be writing a long article about the various intricacies of setting it up and managing it. I couldn’t have been more wrong. In fact it was so easy that I had it set up before I even knew it. Read the full article on Mobile Buzz Guru.